1 v. (various pagings), 24 leaves of plates : col. ill. ; 28 cm. 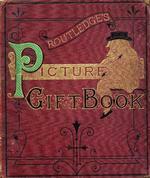 with twenty-four pages of illustrations printed in colours by Kronheim & Co. and Leighton Bros. Some illustrations signed: Dalziel or "H.S.M." (i.e. H.S. Melville). Baldwin Library copy imperfect: lacking illustrations of alphabets, D, F, & M.
THE LION AND THE UNICORN. THE Lion and the Unicorn Were fighting for the crown; The Lion beat the Unicorn All round about the town. Some gave them white bread, And some gave them brown; Some gave them plum-cake, And sent them out of town. THE TAILOR AND TIHE CROW. A CARRION Crow sat on an oak, Fol de riddle, lol de riddle, hi ding do, Watching a tailor shape his cloak; Sing heigh ho, the carrion crow, Fol de riddle, lol de riddle, hi ding do. Wife, bring me my old bent bow, Fol de riddle, lol de riddle, hi ding do, That I may shoot yon carrion crow; Sing heigh ho, the carrion crow, Fol de riddle, lol de riddle, hi ding do. The Tailor he shot and miss'd his mark, Fol de riddle, lol de riddle, hi ding do, And shot his own sow quite through the heart Sing heigh ho, the carrion crow, Fol de riddle, lol de riddle, hi ding de. Wife, Wife, bring brandy in a spoon, Fol de riddle, lol de riddle, hi ding do; For our old sow is in a swoon; Sing heigh ho, the carrion crow, Fol de riddle, lol de riddle, hi ding do. JACK AND THE BEANSTALK. A POOR woman, who lived in a little cottage in the country, had an only son. His name was Jack, and though he was rather idle and fond of play, he was a kind, good-tempered boy. They were so poor that as Jack could only earn a little money now and then by frightening birds away from the corn or by picking up stones and weeds out of the fields, the poor woman was forced to sell her cow, and sent her son with it to market, where he met a butcher, who offered him a hat full of beautiful coloured beans for it. Jack was so pleased with this bargain that he went dancing home to show his mother the beans, and she was so angry that she threw them out of the window, and after sending the boy to bed without his supper, sat down to cry. Early in the morning, when Jack looked out of window, he saw that the beans had taken root, and that a great beanstalk had grown in the night so high that he could not see the top of it. He was out of bed in a minute, and began to climb the beanstalk; but it took him a long time to get to the top, where he met an old woman, who told him that a giant lived in a great house not far from where they were, near the mountains, and that if he would be careful and had the courage to go to the house, he might get back the wealth of which that very giant had robbed his father. E an Engineer, files and hammers away, Moulding iron and brass as though they were clay. F is a Flower-girl, fair and modest as well, Who with a sweet voice cries "Flowers to sell." G is a Gardener, of such skill and care, That no flowers or plants with his can compare. H is a Hatter, who alters the brims And crowns of his hats, to suit fashion's whims. HUMPTY DUMPTY. HUMPTY DUMPTY Sat on a wall; Humpty Dumpty Had a great fall. All the King's horses, And all the King's men, Couldn't set Humpty Dumpty on the wall again! CINDERELLA AND THE LITTLE GLASS SLIPPER. POOR Cinderella had to light the fires and do all the work of the house, while her two sisters-in-law took their pleasure. One night they went to a ball at the King's palace, and after she had helped them to dress in their fine clothes, Cinderella sat down to cry. A little old woman came in and said, "I am a fairy, and you shall go to the ball, for you are a good girl." The old woman told her to go into the garden and fetch a pumpkin, and behind the pumpkin were two shining green lizards. When she came back six rats came out of a hole in the floor. Then the fairy waved her crutch stick over them all and turned the pumpkin into a fine coach, the two lizards into green coated footmen, and the six rats into beautiful horses. After this she gave Cinderella a rich dress, and a pair of charming little glass slippers which just fitted her. Mind you don't stay after the clock strikes twelve," said the old fairy, "or all these things will change again." Cinderella went to the ball where nobody knew her, though everybody admired her beauty, and the young Prince fell in love with her. While she was talking the clock began to strike twelve, and she was obliged to run away so fast that she left one of her slippers on the steps of the palace. The next day the Prince sent everywhere to find the owner of the little glass slipper, but it would fit nobody but Cinderella, and so the Prince himself came to see her. They were married soon after, and the good, gentle girl became a kind and beautiful Queen. I is an Innkeeper, with flagon of ale, Which J the Joiner will drink without fail. K a Knife-grinder, sharpens all kinds of blades, Razors, scissors, and tools for all sorts of trades. L a Lamplighter, nimbly skips up and down, And lights in a twinkling the lamps of the town. M is a Milkmaid, whose heart is as light As her milk is pure and her cans are bright. QUEEN ANNE. QUEEN ANNE, Queen Anne, You sit in the sun, As fair as a lily, As white as a wand. I send you three letters, And pray read one: You must read one, If you can't read all; So pray, Miss or Master, Throw up the ball. -~gig ea-:i10 All#I~i ii-gar ,(I~LETI;:1T N, BROS.
A is an Artist, who copies so well, That likeness from sitter one scarcely can tell. B is a Blacksmith, who hammers away With a clang and a clatter throughout the whole day. C is a Cobbler, who sticks to his last, His work strong and neat, though he stitches so fast. D is a Dressmaker, whose work seems but play, For she's making a dress for her own wedding day. THIS LITTLE PIG WENT TO MARKET. XR is a Reaper, before whose keen blade Falls the ripe corn God's goodness has made. S is a Shrimper, who gleans from the sea The shrimps and the prawns that give zest to our tea. T is a Tinker, who, when holes are found, In old pots or kettles, will soon make them sound. V is a Verger, courteous and grave, Who points out the tombs of the pious and brave. Jack went up to the great gate of the house, and there saw the Giant's wife, of whom he begged a little food and a night's lodging. The woman told him that she dared not let him in, for her husband ate human flesh, and had already killed two or three travellers;. but Jack begged so hard that at last she took him in, fed him, and hid him in the oven. When the Giant came home he roared out, "Wife, I smell fresh meat;" but the woman said it was only a cat that had caught a bird. After supper the Giant called for his hen, and Jack peeping out of the oven saw that whenever her master said, lay," the hen laid a golden egg. Presently, when the Giant fell asleep and shook the room with his snoring, Jack came out softly, and escaped with the hen. His mother was delighted to see him; but Jack was impatient to be up the beanstalk again; and the second time, after a great deal of trouble, he persuaded the Giant's wife (who had forgotten him) to hide him in a closet. After supper, the Giant amused himself with counting two great bags of money; and Jack contrived to take these away, although a little dog barked so loudly that he was afraid the Giant would awake. On his third visit Jack, who was disguised, hid in the copper, and saw the Giant's fairy harp, which would play by itself. It played the Giant to sleep, and Jack ran off with it; but not before the Giant was after him. Before he was half down the bean-stalk Jack was at the bottom, and cutting the roots with a hatchet let the Giant to the ground, where he was killed with the fall. LITTLE BO PEEP. T H I S is Little Bo Peep, who lost her sheep, And couldn't tell where to find them; Till she sat herself down and went to sleep, A great deal too tired to mind them. While little Bo Peep was fast asleep, She dreamed that she heard a bleating; But when she jumped up those naughty sheep, Were all of them still retreating. So little Bo Peep ran after her sheep, But, alas! she couldn't find them; Till they'd all through a thorn bush tried to leap, And left their tails behind them. LITTLE BOY BLUE. LITTLE Boy Blue, Come, blow up your horn, The sheep's in the meadow, The cow's in the corn; Where's the little boy That looks after the sheep? He's under the haycock, fast asleep. Will you wake him? No, not I; For if I do, he'll be sure to cry. W a Washerwoman, always is seen At her tub, hard at work, rubbing dirty things clean. X stands for excellent, when on barrels of beer, So the more x's the better the cheer. Y is a Yeoman, whose fields are well till'd, His men are well housed and his barns are well fill'd. Z stands for Zoologist, also for Zany; So please take your choice, that's if you have any. THE THREE BEARS. T HERE was once a little girl who was called Silverlocks JI because her hair was so bright and shiny, and though she was a pretty child, she was always in mischief and meddling with what did not belong to her; till the neighbours said she was more trouble than she was worth. One day she went into a wood a long way from home and saw a little cottage with the door left open. In she went directly, hoping to be able to play some pranks there. Now the cottage belonged to two Bears, named Mr. and Mrs. Bruin, and to their little Bear whose name was Tiny, and they had all three gone for a walk leaving some soup on the table to cool. As soon as Silverlocks smelt the soup, she took the little pipkin that had been placed for Tiny, and being hungry very soon emptied it; then she sat down on a nice little chair and began to rock backwards and forwards till she broke it; and at last went upstairs and lay down on a soft little white bed that she found there. She was fast asleep when the Bears came home, and did not hear them growling and crying, Who has been at my soup ? Who has sat on my chair?" It was only when the Tiny Bear was just going to spring on to the bed, that she woke and managed to jump out of window. She' had a sad tumble, but she was quite cured of meddling. THE BRAVE TAILORS. FOUR and Twenty Tailors Went to kill a snail, The best man among them Durst not touch her tail; She put out her horns Like a little Kyloe cow: Run, Tailors, run, or She'll kill you all e'en now. 471 4Vjo T7\ I AIN& \LEIGHTON, Biw. JACK HORNER'S STORIES. W HEN little Jack Horner, who sat in the corner, Had eaten his Christmas pie, He looked up and said, "Before I go to bed, A story to tell you I'll try, About Jack and Jill, who, their bucket to fill, Went up the steep path to the well, Till Jack tumbled down and almost cracked his crown, While Jill quickly after him fell. Then there's a nice story about Jack-a-nory, Who met with the old Goosey Gander; As well as another about Jack's own brother, Who couldn't tell which way to wander; Or about the old woman, who lived in a shoe, And had forty children-so what could she do But give them some gruel without any bread, With a nice rod in pickle, to whip them to bed?